A political map showing national divisions in relation to the ecological break (Sub-Saharan Africa in green). 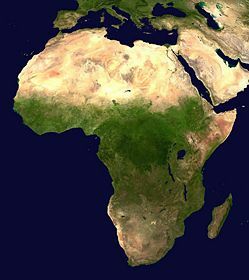 Sub-Saharan Africa is the term used to describe the area of the African continent which lies south of the Sahara Desert. Geographically, the demarcation line is the southern edge of the Sahara Desert. Since the end of the last ice age, the north and sub-Saharan regions of Africa have been separated by the extremely harsh climate of the sparsely populated Sahara, forming an effective barrier interrupted by only the Nile River. The regions are distinct culturally as well as geographically; the dark-skinned peoples south of the Sahara developed in relative isolation from the rest of the world compared to those living north of the Sahara, who were more influenced by Arab culture and Islam. The modern term sub-Saharan corresponds with the standard representation of north as above and south as below. Tropical Africa and Equatorial Africa are alternative modern labels, used for the distinctive ecology of the region. If strictly applied, however, these terms would exclude Southern Africa, most of which lies outside the Tropics. 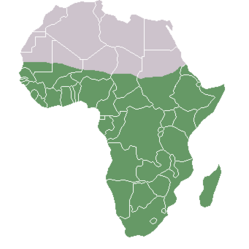 A geographical map of Africa, showing the ecological break that defines the sub-Saharan area. Africa is Earth's oldest and most stable landmass, with most of the continent having been where it is now for more than 550 million years. Most of it is a vast plateau, with only ten percent of its land area below an altitude of 500 feet. Near the equator are humid rainforests, but north and south of that band, most of sub-Saharan Africa is savanna, grasslands with scattered trees. In the south, the Kalahari Desert stretches along the Atlantic coast. Climate is influenced largely by distance from the equator and altitude. In the highlands, it can be temperate, even close to the equator. Rainy and dry seasons alternate, although precipitation is more consistent in the humid forests. Rocks that solidified during the early cycles of eruptions on Earth are the greatest source of economically important metals, particularly gold and diamonds. The great age of sub-Saharan Africa's rocks has made the region well endowed with these and other metals, including copper and chromium. Revenues from extractive industries are central to the political economy of many African countries and the region as a whole. In 2001, oil production generated 20 percent of the combined GDP of sub-Saharan Africa. In 2002, mining constituted about eight percent of the GDP of the Southern Africa Development Community and 43 percent of the region’s exports. Globally, Africa is becoming increasing important to world energy supplies. It is expected to contribute a fifth of the global increase in petroleum production between 2004 and 2010. Proven reserves have doubled in the last decade. The Atlantic Ocean off the coast of west and southern Africa continues to be one of the world’s most active areas for oil exploration. However, in many countries, the extractive industries have had a devastating impact, fueling conflict, corruption, and economic decline. Sub-Saharan Africa, especially East Africa, is regarded by some geneticists as being the birthplace of the human race (the genus Homo). Stone tools are first attested around 2.6 million years ago, when H. habilis in Eastern Africa used so-called pebble tools: choppers made out of round pebbles that had been split by simple strikes. This marks the beginning of the Paleolithic, or Old Stone Age; its end is argued to be the end of the last ice age, around 10,000 years ago. The early inhabitants of Africa lived in small groups and obtained food by foraging and fishing. About twenty thousand years ago, some people began a more settled existence and developed agriculture. The region has been the site of many empires and kingdoms, including the Axum, Wagadu (Ghana), Mali, Nok, Songhai, Kanem-Bornu, Benin, and Great Zimbabwe. It is generally accepted that the Bantu-speaking peoples originated from West Africa around four thousand years ago. In several major waves of migration and dispersal they moved east (at first north of the tropical rainforest to the northern region of East Africa) and then south, coming to occupy the central highlands of Africa in the third wave. From there a final southwards migration took place into the southern regions of Africa, which is measurable from around two thousand years ago. The final movement into the southern regions resulted in the displacement of the aboriginal Khoikoi and Khoisan peoples, resulting in some ethnic and linguistic mixing. They utilized relatively advanced technologies for working with iron compared to the people they displaced. During the 1700s, the slave and ivory trades were expanding in southern Africa. To resist these pressures, King Shaka formed the Zulu chiefdom. As a result, conquered tribes began to move north, into present-day Botswana, Zambia, and Zimbabwe, in the process setting off reactions in these areas that had lasting ramifications. In Botswana, for example, tribes began to exchange ivory and skins for guns with European traders, who had begun to reach the interior. Missionaries sent from Europe also spread to the interior, often at the invitation of chiefs who wanted guns and knew that the presence of missionaries encouraged traders. In Zimbabwe, the Shona were conquered by the Ndebele, an offshoot of the Zulus who had split from Shaka and migrated north in response to the Zulu mfecane. Tensions between the Shona and Ndebele persist to this day. The government of Robert Mugabe systematically killed between twenty and thirty thousand Ndebele people between 1982 and 1987 (according to Amnesty International estimates). In Africa, slaves taken by African owners were often captured, either through raids or as a result of warfare, and frequently employed in manual labor by the captors. Some slaves were traded for goods or services to other African kingdoms. The Arab slave trade from East Africa is one of the oldest slave trades, predating the European transatlantic slave trade by hundreds of years. Male slaves were employed as servants, soldiers, or laborers by their owners, while female slaves, mostly from Africa, were traded to Middle Eastern countries and kingdoms by Arab and Oriental traders, some as female servants, others as sexual slaves. Arab, African, and Oriental traders were involved in the capture and transport of slaves northward across the Sahara Desert and the Indian Ocean region into the Middle East, Persia, and the Indian subcontinent. From approximately 650 C.E. until around 1900 C.E., as many African slaves may have crossed the Sahara Desert, the Red Sea, and the Indian Ocean as crossed the Atlantic, and perhaps more. The Arab slave trade continued in one form or another into the early 1900s. The transatlantic slave trade originated as a shortage of labor in South and North America and later the United States. Massive amounts of labor were needed, initially for mining, and soon even more for the plantations in the labor-intensive growing, harvesting, and semi-processing of sugar (as well as rum and molasses), cotton, and other prized tropical crops. To meet this demand for labor, European traders turned to Western Africa, part of which became known as "the slave coast," and later Central Africa as major sources of fresh slaves. North America imported 500,000 African slaves, the Caribbean four million. South America, with Brazil taking most of the slaves, imported 4.5 million before the end of the slave trade. Millions more died as a result of the inhumane conditions under which the slaves were transported. The Berlin Conference of 1884-85 regulated European colonization and trade in Africa and is often seen as the formalization of the Scramble for Africa. 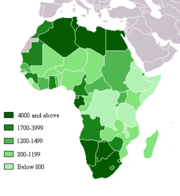 In the 1880s, European interest in Africa increased dramatically. Sub-Saharan Africa was attractive to Europe's ruling elites for both economic and racial reasons. During a time when Britain's balance of trade showed a growing deficit, with shrinking and increasingly protectionist continental markets due to the Depression from 1873-1896, Africa offered Britain, Germany, France, and other countries an open market that would garner a trade surplus. At the Berlin Conference, Africa was divided among the main powers of Europe. One part of the agreement stated that powers could only hold colonies if they actually possessed them, in other words if they had treaties with local chiefs, flew their flag there, and established an administration in the territory. The colonial power also had to make use of the colony economically. If the colonial power did not do these things, another power could do so and take over the territory. It became important to get chiefs to sign a protectorate treaty and to have a presence sufficient to police the area. In the aftermath of World War II, Africans sought independence for their states, partly as a means to achieve equality of status, modernization, and economic development that would benefit them. With the exception of southern Africa (Angola, Mozambique, Zimbabwe, Namibia, South Africa), most of sub-Saharan Africa achieved independence in the 1960s. In a number of cases, the military took over political leadership for a period of time, or strongmen controlled the governments, sometimes on the socialist model, with only one political party permitted. The fall of the Soviet Union and Eastern bloc, with their support for client states during the Cold War, resulted in renewed appreciation of the value of free markets in bringing prosperity. States that had been following the socialist model instituted reforms to liberalize their economies. In response to both internal and external pressures for change, the sub-Saharan states also increasingly liberalized their political processes, permitting opposition parties to organize and allowing greater freedom of the press. After several years of steady gains for democracy, Sub-Saharan Africa has suffered some recent setbacks. According to Freedom House, Republic of Congo (Brazzaville), Burundi, Chad, Cote d'Ivoire, Somalia, and South Africa were among those countries that suffered declines. On the positive side, Freedom House noted the holding of successful presidential elections in Democratic Republic of Congo (Kinshasa), the first in the country's history, and progress in fighting corruption and expanding government transparency in Liberia. Generally, sub-Saharan Africa is the poorest region in the world, still suffering from the legacies of colonialism, slavery, native corruption, socialist economic polices, and inter-ethnic conflict. The region contains many of the least developed countries in the world. Many governments face difficulties in implementing policies aimed at mitigating the effects of the AIDS-pandemic, such as the explosion in the number of orphans. National GDP per capita ranges from wealthier states in the north and south to poorer states in the east. These figures from the 2002 World Bank are converted to US dollars. While no African nation has joined the ranks of the developed nations, the entire continent is not utterly impoverished and there is considerable variation in its wealth. South Africa is by far the continent's wealthiest state, both in GDP per capita and in total GDP, and its neighbors have shared in this wealth. The small but oil-rich states of Gabon and Equatorial Guinea are among the wealthiest states in Africa. But even in these relatively wealthy nations, extreme disparities of income exist. The more temperate northern and southern ends of the region are wealthier than tropical sub-Saharan Africa. Within the tropics, East Africa, with its long pre-colonial history of trade and development, has tended to be wealthier and more stable than elsewhere. Island nations such as the Seychelles, Cape Verde, and Mauritius, have remained wealthier than the continental nations, although the unstable Comoros remain poor. The poorest states are those engaged in or just emerging from civil wars. These include the Democratic Republic of Congo, Sierra Leone, Burundi, and Somalia. In recent times the poorest region has been the Horn of Africa, although it had historically been one of the wealthiest regions of sub-Saharan Africa. Ethiopia in particular had a long and successful history, in contrast to the current poverty of the region and the associated famines and wars. There is also considerable internal variation within countries. Urban areas, especially capital cities, are generally wealthier than rural zones. Inequality is pronounced in most African countries. In 2006 the majority of the countries in sub-Saharan Africa had median ages of less than 20, compared to over 30 in Asia and Latin America, 36 in the United States, and over 40 in Europe and Japan. Life expectancy at birth ranges from 61.8 years in Madagascar to 32.6 in Swaziland. In 25 countries, it is below 50 years. In seven countries, it is 40 years or less. These figures are attributed to poor access to health care, low living standards, conflict, but especially the impact of the HIV/AIDS pandemic. Two million had died of HIV/AIDS in sub-Saharan Africa by 2005, and the number is still rising. There are some 12 million AIDS orphans. Most of the people living in sub-Saharan Africa speak one (or more) of about six hundred Bantu languages, as well as the European language of the former colonial power. In terms of religion, the majority tend to be Christian or Muslim, with a smaller percentage still practicing indigenous religions, although the latter may also influence the practices of the mainstream religions. The AIDS pandemic is ravaging most of sub-Saharan Africa's population, leaving millions of orphans and depleted labor pools for future growth. Part of the problem is a long-standing treatment of females as inferior and as objects of sexual exploitation. Expanding opportunities for education, especially in rural areas, is crucial to the future growth of sub-Saharan Africa. Those nations that have invested heavily in education and have higher rates of literacy are better poised to participate in the global economy. Many of the economies of the region are dependent on subsistence agriculture and the export of natural resources, both cash crops such as coffee and cocoa, and metals. The political and legal environments influence the level of foreign investment. In many of the nations, environmental concerns have taken a back seat to exploitation of resources and the need to feed growing populations, but this cannot continue indefinitely. Pollution, overfishing, and excessive use of the water in the African Great Lakes, for example, are already having serious effects on the surrounding East African nations. This page was last modified on 23 October 2015, at 15:41.